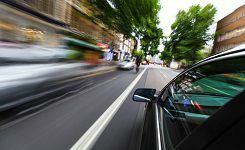 Illinois Car Accidents Caused by Speeding | Hupy and Abraham, S.C.
For many people, getting from Point A to Point B is a task that should take as little time as possible. Life is too busy to spend commuting in the car. Some drivers choose to shorten their drive time by speeding. However, even if speeding shortens the drive a little bit, it is not worth breaking the law and it is not worth causing a serious or fatal car crash. In 2013—the most recent year for which complete statistics are currently available—speed was a factor in more than 31 percent of all Illinois car accidents and more than 35 percent of all accidents that resulted in injury or death. Every driver has a responsibility not to speed. That is defined in two ways. First, an Illinois driver may be speeding if the driver exceeds the posted speed limit or exceeds 65 mph on rural interstates, 55 mph on highways in urban areas, or 30 mph on city roads. Second, a driver may be speeding if the driver is traveling without reasonable regard for traffic conditions. In 2014, a new Illinois law was passed that makes traveling 26 mph or more over the speed limit a crime. Jail time and a fine may be issued to drivers who exceed the speed limit by 26 mph or more. However, all drivers—even those traveling less than 26 mph over the speed limit—may be liable in a civil court of law if their speed causes an accident. If a speeding driver caused your accident injury or your loved one’s death, then it is important to contact an experienced Illinois car accident lawyer as soon as possible. Speeding is against the law, but that does not mean that your case will be simple. Instead, evidence must be presented and persuasive arguments must be made so that you can get the recovery that you deserve. To learn more, please download a free copy of our book, The Ultimate Guide for Automobile Accident Victims, or call us today at 1-800-800-5678 for a free consultation.